When it comes to mobile gaming there are generally two camps that games fall into. We have the games that are absolutely great for dipping into when standing in line at the market and then we have the games that take hours from you in a similar vein to some of the very best console or PC games. It’s rare that you find a game that somehow manages to straddle the two camps, but in Pocket City ($3.99) we have a shining example of exactly that. This is a game that you can play in small stints but also settle down with, falling into a world other than your own. Pocket City is responsible for me going to sleep two hours later than I should have this past weekend. It’s that good. You don’t need to be a gaming fanatic to be familiar with the Sim City franchise and it is absolutely fair to say that Pocket City borrows heavily from those games. In all fairness it’s fairly difficult to create a city building game without it being compared to the game that arguably started it all, and in that regard Pocket City stands up to the comparisons well. Many of the mechanics are possibly a little too familiar for my liking, but others have just enough of a twist to them to keep Pocket City from feeling too much like a homage, or worse, a straight copy of a much loved franchise. I was a huge fan of Sim City 2000 and while subsequent Sim City games left me surprisingly cold, including the mobile versions, Pocket City manages to rekindle the love in a way I did not quite see coming. Right off the bat Pocket City will feel instantly familiar and in a good way. The game opens up with an isometric city on which gamers have their Town Hall and that’s about it. From here they are tasked with building infrastructure like roads, power stations and of course water towers. Those three tentpoles are the lifeblood of Pocket City because without them, no city can thrive. Yes, you will need to find the best way to set up your Residential, Commercial and Industrial zones – just like Sim City – but none of those can flourish without being watered, powered and accessible. You will do well to remember that as you start out. Speaking of starting out, the whole initial progression of Pocket City plays out as a tutorial of sorts and one that may hand hold a little too much for some although it can thankfully be skipped for those of us who are seasoned veterans of the genre. Tutorial or not, gamers will find that they are unable to build certain attractions or amenities until they ‘level’ up to a point at which the game deems them worthy. We’d like to be able to build that awesome fire station right off the bat, or the police station with accompanying helicopter but you’re held back from such delights, often at the behest of the tutorial but also in order to allow the game’s story-like progression to unfold. It’s fine, but it might make some feel like they’re behind held back from all the good stuff. Thankfully, nobody will be held back by the kind of things that normally cause constination with games like this. Right off the bat your $4.99 will get you the full Pocket City experience. That means that there are no timers, no in-app purchases and nothing to get in the way of your fun. That’s probably how I managed to lose an evening and early morning to the game, but that’s probably my fault more than its! The only limit to your play time is likely to be your battery and the in-game currency that, in all honestly, is so easy to accrue I cannot imagine ever managing to run out no matter how aggressive the city expansion becomes. Of course, in time honored Sim City fashion, Pocket City does have a way of ruining your day every now and then in the form of Disasters which, thankfully can be turned off. When on, gamers will be on the receiving end of random disasters which in my testing amounted to tornadoes which generally wreaked havoc across my city. Schools, hospitals, infrastructure and anything else unfortunate enough to get in its way were destroyed, just as youd expect. However, unlike previous games of this ilk that I have played, Pocket City allows gamers to instantly undo the damage that has been done thanks to a ‘Rebuild Everything’ button that does exactly what it sounds like it should. There’s a cost incurred, but it’s sure better than either leaving the destruction as a badge of honor or undoing the damage manually. 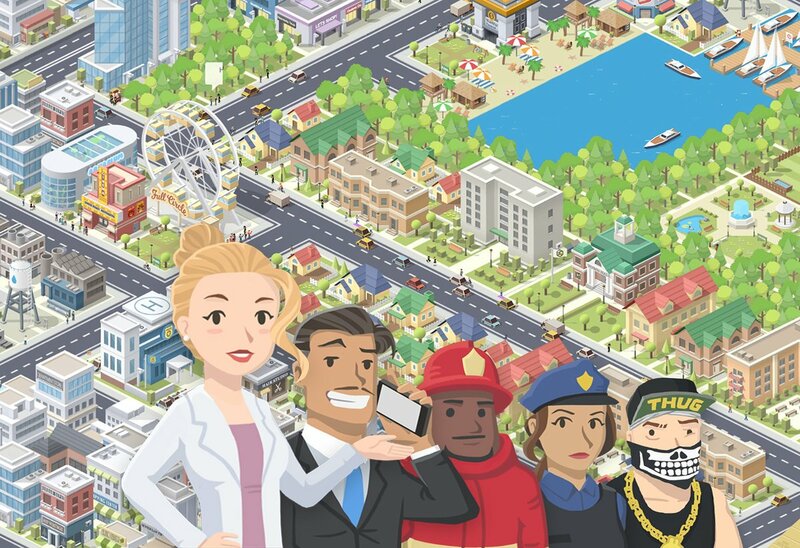 A game like Pocket City is ultimately a difficult one to review, partly because gamers will have different experiences depending on how they build their city. Some will be happy to build relatively small cities but have them be dense metropolises while others will want to create a sprawling city that touches each and every corner of the map. Both approaches have their advantage and with additional areas of the map purchase-able via the in-game currency things can start to get expensive, fast. No matter the size of your city you might work your way through the events that can be thrown including street parties or rocket launches. You might make it a personal mission to progress through the quests that help to build your knowledge of the game while also having you build certain things or upgrade them to bring new mechanics into play. Or you might just want to keep zoning areas, building roads and just increasing your population to as big a number as possible. Ultimately it doesn’t really matter how you play Pocket City, I think you’ll have a blast regardless. And it won’t cost you a penny beyond that $4.99 purchase price to do it.